Version Difference Editor can be used to View files/folders both in New & Old Version Images, to change various file attributes necessary for difference / patch building or update installation or to change update commands and their parameters for particular difference. Depending on the operation and status, files and folders are highlighted with a certain color. Legend Bar is placed at the bottom of Version Difference Editor window. To change the default color - double click on the appropriate item in the Legend Bar. 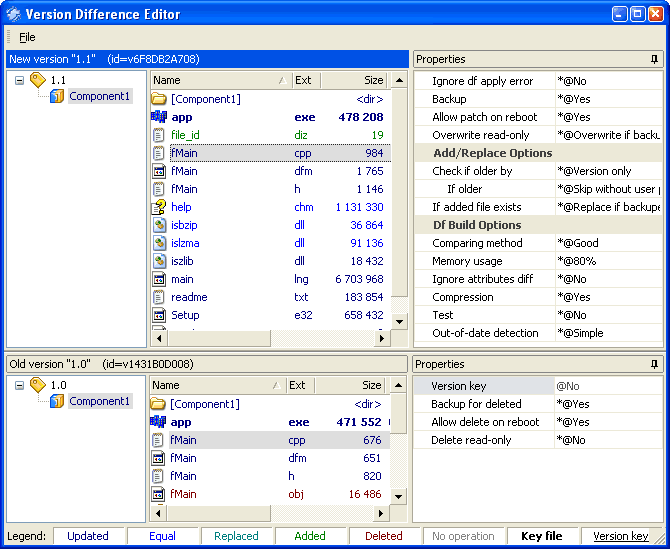 · Properties window - used to set properties necessary for difference / patch building or update installation. This window can be used to select necessary Version Image or a Component inside it, to set/observe properties of selected objects. To change object property - select it in the appropriate Version Image and then change necessary property value in the Properties window. By default Synchronous selection mode when pairs of files in old and new version images are highlighted (selected) synchronously is turned on. You can switch it off by selecting the appropriate item in Files menu. Tabstops header on the top of each window allows sorting of the file list by Name, Date and Size by clicking on the appropriate header. Clicking a second time on the same header reverses the order. Arrow to the left of the header text shows the sort direction. Main properties that can be set are listed in Old Version Side Properties, New Version Side Properties, Add/Replace Options and Df build Options sections of this manual. Each property of difference elements has such implicit attribute as "Source of the obtained value". This attribute defines the method of determining the particular value of the Update command. · individual value, which you can set by clicking with right mouse button on the appropriate file. Available values and their descriptions are listed in the Update Command generation section of this manual.